You've put a lot of thought into your wedding day. Now let's add the exclamation point with a stunning array of exquisite flowers. 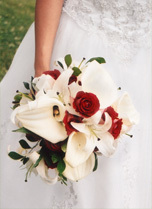 Maybe you envision a romantic hand-tied bouquet of roses, or an elegant line of a cascading callas. Together, we'll create the look that compliments your gown, the color scheme, and the feel of your special day. Don't forget your parents, grandparents and special guests with floral fashion. Wearing flowers symbolizes their place of honor in your lives. Let's create a delicate shoulder or wrist corsage to wear, or maybe a delicate nosegay to carry for the women in your lives. The boutonnieres can echo the theme of the bouquets and body flowers, giving a fashionable touch to the men's tuxedo or suit. The children in the wedding party will be delighted to carry and wear flowers! Do you envision a sweet halo with a matching pomander for your flower girl? Or a scaled-down to size boutonniere for the tiny ring bearer with a matching cluster of flowers on the pillow he'll carry. If the children are very young, clutching a stuffed animal down the aisle might be the security blanket they'll need. Let's add a ring of flowers around a teddy bear's neck matching the theme of the wedding party. Whatever you select, let's work together to create enchanting flowers for your wedding.